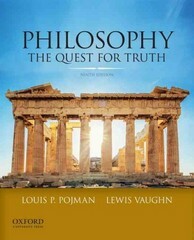 Philosophy 9 Edition Praised for its unique combination of accessibility and comprehensiveness, Philosophy: The Quest for Truth provides an excellent selection of ninety-one classical and contemporary readings--on nineteen key problems in philosophy--carefully organized so that they present pro/con dialogues that allow students to compare and contrast the philosophers' positions. Each of the readings is accompanied by study questions, end-of-reading reflective questions, and an individual introduction featuring a biographical sketch of the philosopher. A tutorial on logic and argument, a time line, boldfaced key terms, a detailed glossary, and an appendix on reading and writing philosophy papers further enhance the text's pedagogical value. In addition, each major section opens with a substantial introduction and ends with a short bibliography.